The Golden Circle Classic is our bestselling day tour! See the world famous erupting geyser & hot springs, experience the magnificent Gullfoss Waterfall and follow in the footsteps of the Vikings of old as you walk down the lava canyon where the American and Eurasian continents are literally pulling apart in Þingvellir. And all this in only eight hours! Step on board one of our new buses, equipped with WiFi connected computer tablets in each seat. On the tablets you can use our GPS Sensitive In Bus Audio Guide, available with a choice of 10 languages. Aboard will also be a local host, that will happily answer any questions you might have about our peculiar country. In each seat you will also find a USB Charger. 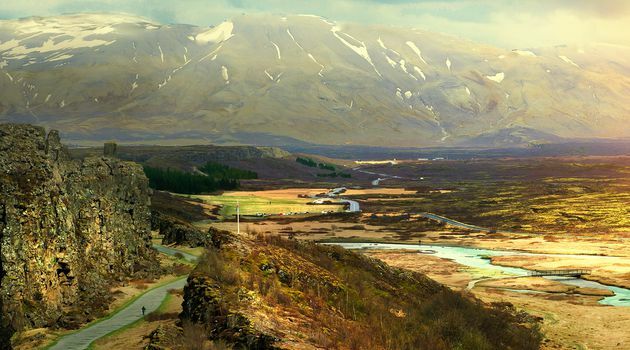 The tour starts with a stop in Þingvellir National Park, a UNESCO World Heritage Site listing and the birthplace of the oldest existing parliament in the world. This is also where the gigantic tectonic plates of America and Eurasia have pulled apart and the resulting rift valley is right there before your eyes on the shores of Iceland's biggest lake. Visit the Geysir Hot Springs, the home of the one-and-only original geyser and Iceland's most iconic natural attraction. Here the ground trembles and steaming hot water spouts spectacularly skywards from the famous Strokkur Geyser every few minutes. Now for a leisurely walk down to Gullfoss Waterfall, which is an awesome sight to behold. Here a powerful glacial river cascades down 32 meters on two levels and into a narrow canyon with a thunderous roar. Simply put, if you only do one tour in Iceland, then this should be the one! For the use of our In-Bus-Audio-Guide: Bring your own headphones. Otherwise we sell earphones on the bus.